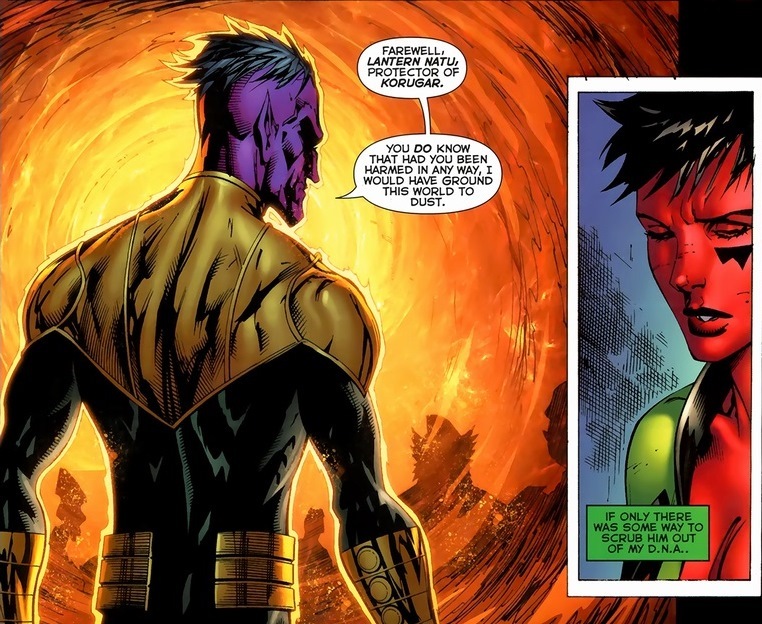 As we left off, Weaponer kidnapped Green Lantern Soranik Nau because she happens to be Sinestro’s daughter. 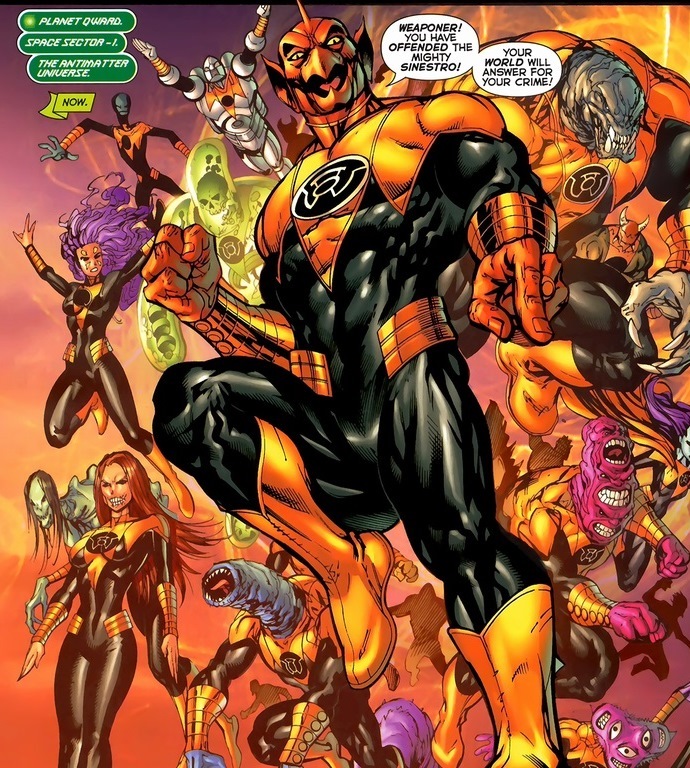 The Green Lantern Honor Guard mount a rescue, fail, and moments before their doom, the entire Sinestro Corps shows up all ring trigger-happy. Now we’re all caught up. 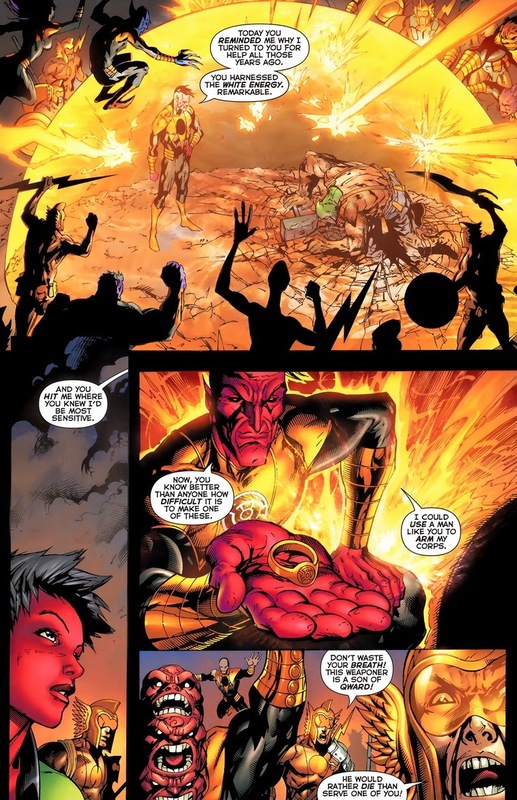 So how does Sinestro convince his army to fight his personal battles for him? Propaganda, mostly. 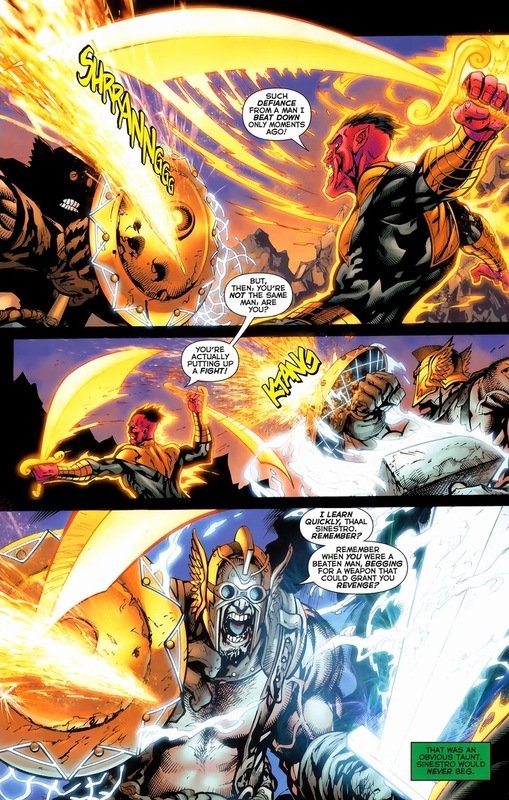 See how Sinestro refers to the Weaponer’s actions? The Qwardian “stole” his daughter, as if Natu’s property and not a living person who justifiably hates her father. 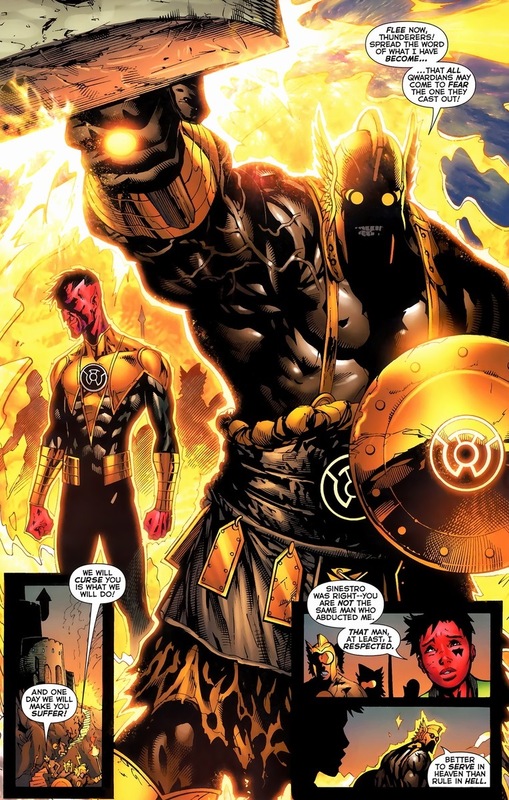 Y’see, since the Sinestro Corps rings power off of the fear the ring-bearer is capable of inflicting on others (making a candidate like Batman’s baddie Scarecrow or say, Batman himself, fantastic candidates), the majority of the Sinestro Corps have fairly long rap sheets. Murderers and other unpleasant people. 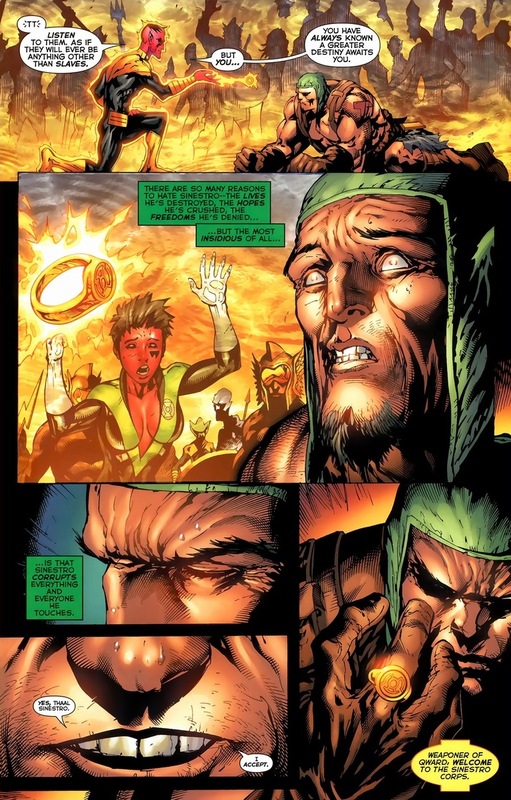 So when Sinestro sends his troops into battle, everyone dies. Psychopaths tend not to worry too much with collateral damage. 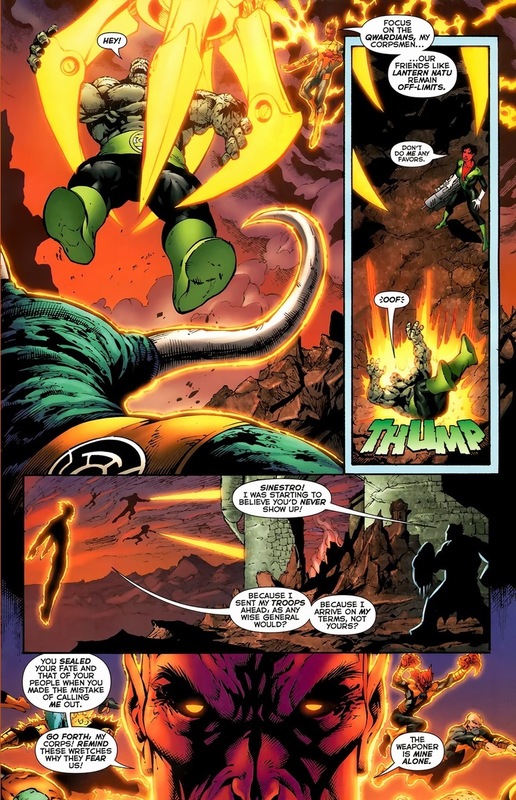 Yes, with the truce in effect, Green Lanterns and Sinestro Corps members can’t attack each other with their rings, but bazookas, grenades, or giant rock monsters don’t count. Finally, in one of the most beautiful pages I’ve seen, Sinestro arrives, because spectacular narcissism demands a spectacular entrance. While I listed Green Lantern as the first name in the article title, Kyle Rayner doesn’t really factor into the story anymore or really matters into the big picture at all. I did it mainly for shameless misguided views. 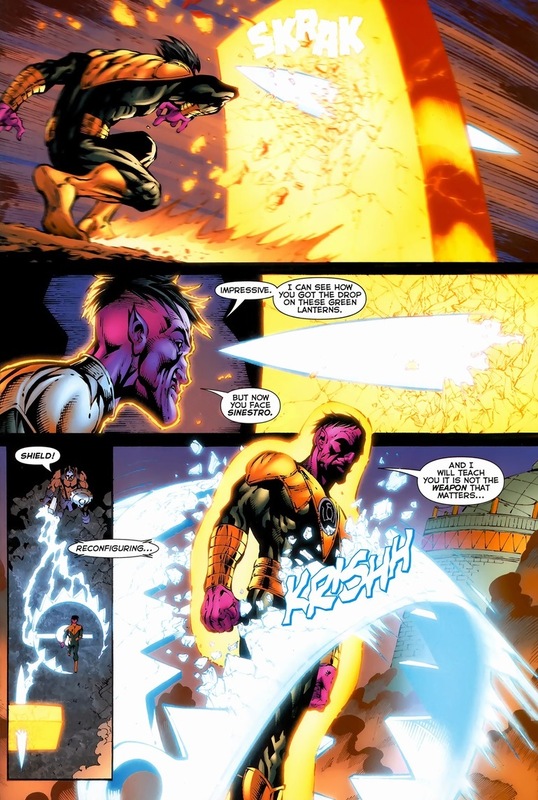 But as Sinestro battles the Weaponer (who singlehandedly took down the Green Lantern A-team), we get reminded time and time again that the purple supervillain is one of the most powerful beings in the universe. I mean, another reminder. 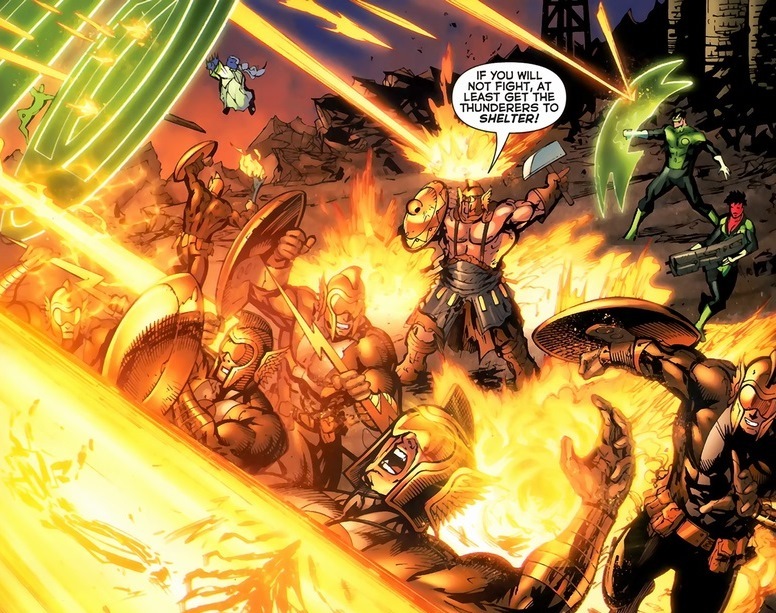 Oh, how the Green Lanterns try to save the man who kidnapped and then hit them with shields and hammer and stuff. Being good guys always ends up being such a hassle. I’m surprised the artist can actually finish one issue a month with the sheer amount he has to draw. Intergalactic warfare takes up so much sketching time. 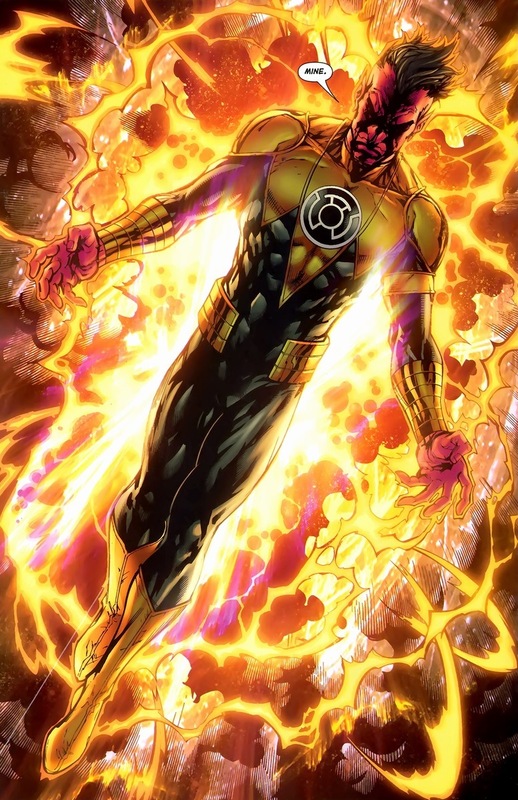 Non-comic book readers probably don’t know of Sinestro. He can’t compete with the name recognition of Lex Luthor or the Joker. 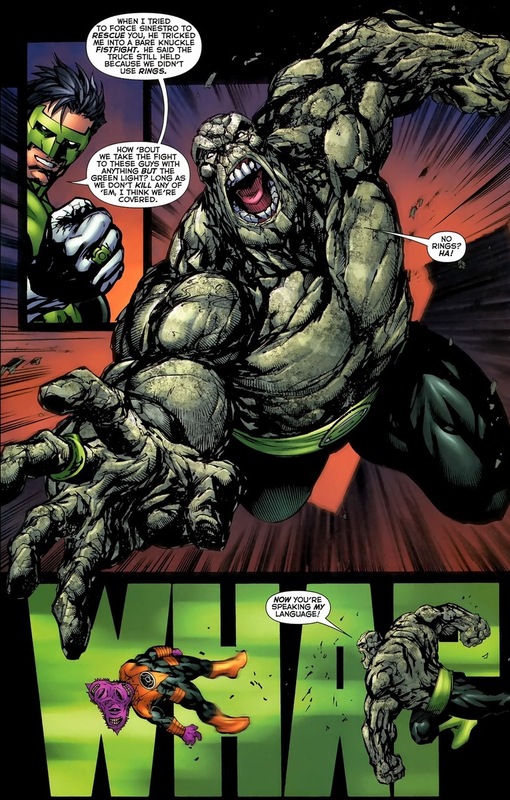 But Geoff Johns took this man and transformed him into not only a crazy powerhouse, but a complex force driven by his pride as much as his villainy. 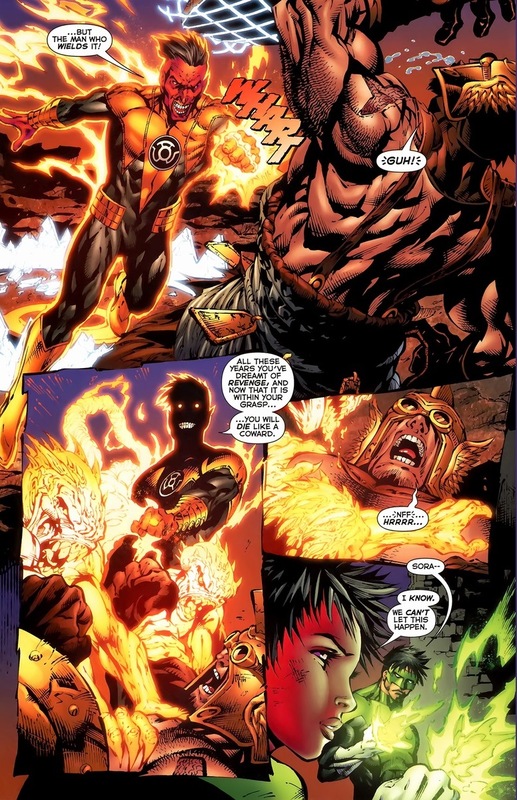 From his actions in Blackest Night, the New 52, and numerous other stories from Johns’ run, Sinestro’s name should be common knowledge among anyone who enjoys superheroes. Even with that pencil thin mustache. Hell, especially with that pencil thin mustache. And now he claims victory over an opponent who never stood a chance. 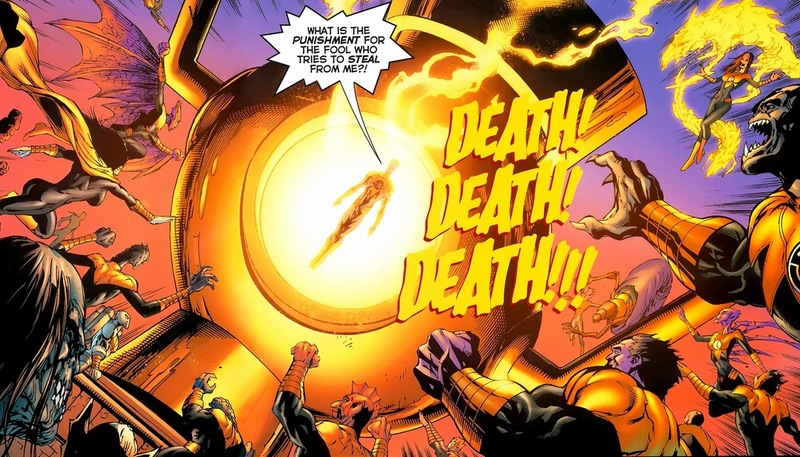 I wish I could say the Weaponer becomes significant supervillain, but he only appears one more time as a supporting character in Green Lantern: New Guardians #8-12, volume two, if you possess a burning desire for more Weaponer. As we end today, I like to think that among the scores of Qwardian deaths and the loss of their greatest forger, they still got off easy, Thank goodness.